A blizzard is coming, so Mother Rabbit bakes carrot cake and knits her beloved Little Rabbit a hat. He loves it and asks her to make hats for their friends too. She happily agrees, they work together on the hats, and the friends (after seeing how warm they are and how special they feel wearing them) are very appreciative. 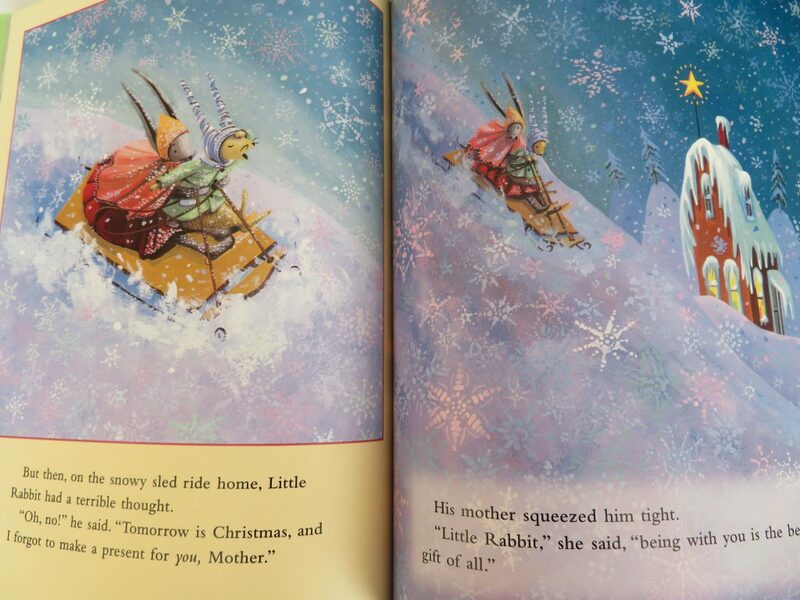 Mother Rabbit and Little Rabbit go home and have carrot cake, warm and secure in each other’s love and being together (“the best gift of all”). The end. It sounds so simple, but the pictures are so lovely and the rabbits are so realistically warm and their relationship is so caring; it may be the coziest book I have ever read. And both the boys still love it, which always surprises me a bit and also makes me happy each year. Apparently it is the first book in a series about Little Rabbit and Mother Rabbit, but we haven’t read the other books (which are focused on particular issues, like handling cleaning up or crying or nightmares).